Camping Sanguli is the holiday camping site for anyone who enjoys relaxed luxury camping amid a spectacular natural landscape, with the option of visiting one of the world’s most vibrant cities, or exploring various historical places. 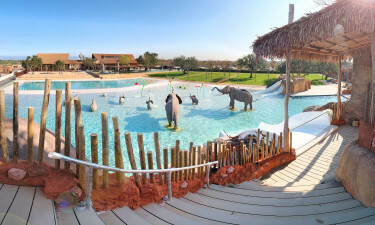 This luxury camping site has every amenity necessary to fulfill a family’s holiday needs, as well as being in close proximity to stunning beaches, further lively entertainment and a host of fine bars and restaurants. Some Reasons for selecting Camping Sanguli for your next family holiday in Spain. Excellent on-site dining and entertainment. Luxury accommodation in scenic settings. Close proximity to golden beaches. The excitement of bustling Barcelona only 100km away. Tarragona is a city that lies only 15 minutes from Sanguli and that offers campers here the added attraction of visiting a UNESCO World Heritage Site with a remarkable history. Once an influential city in the Roman Empire, it safeguards treasures such as a Roman amphitheatre and the remains of a Roman circus that once hosted the chariot races so popular in those times. The luxurious mobile homes at Sanguli are set amongst an abundance of trees and lush shrubbery, and are fully equipped to meet every self-catering need. Furnished terraces invite relaxing drinks at sundown, while spacious interiors provide optimal comfort for watching TV or getting a peaceful night’s sleep. There are, however, excellent facilities for those who prefer eating out. 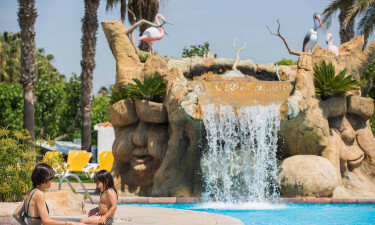 The award-winning region that houses the luxury camping site of Sanguli includes the magnificent Costa Dorada coastline with its golden sands that run tantalisingly close to the entrance of this luxury camping site. With its cliffs, coves and sparkling blue waters, it is a haven for snorkelers, swimmers or those who simply love to lie on powdery sands and soak up the sun. The charming fishing village of Cambrils is a close neighbour of this superb holiday camping site that offers its own unique and relaxed atmosphere. Indoor or outdoor dining is enjoyed to the sound of a waterfall cascading from the enchanted tree at Restaurant Sanguli. The magical setting adds to the mouth-watering tastes and aromas whipped up in the kitchens. Tantalizing international flavours and special children’s menus make dining here a real family camping holiday treat. 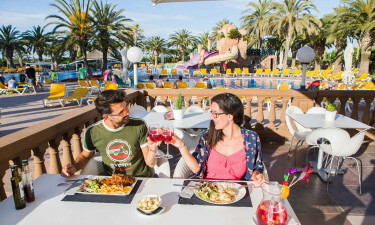 This luxury camping site also offers snack bars, bars and a beach club that provides a wide range of cocktails, snacks and sandwiches to enjoy as you watch a spectacular sunset. The irresistible smell of breads and pastries baking are just part of the freshness provided by the 2 supermarkets that serve Sanguli luxury camping site, while a souvenir shop provides well for tangible reminders of the ultimate camping holiday.